Think back to your early days and your first experiences with paper and pencil games and you'll recall "Dots and Boxes". Perhaps you played it with your parents or taught it to your children ... it's a game with very simple rules but elusive strategies for larger board sizes. We've changed the rules a bit for the POTM (alternating moves, longer lines, and a non-empty starting board) ... click on the picture above for a playthrough of a sample game. You will write a program that will play the game of "Lines and Boxes" according to the POTM rules. Every program will play against every other program in a two game match on a given starting board (each having the opportunity to go first). The program that scores the most match points will win this POTM. If there are ties, the winners will advance to a different board to resolve the ties. 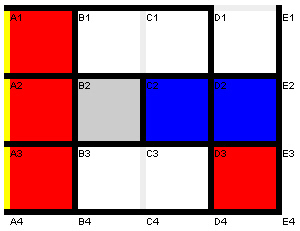 Your program must be able to play on rectangular and square boards with sides from 3 to 8 boxes. LINES and BOXES details the "special" POTM rules. Wikipedia Dots and Boxes Reference description and strategies for the original Dots and Boxes pencil and paper game. This may or may not help with the POTM challenge since our movement rules are very different even though the goal is the same. If it sounds interesting, sign up using the Members Section link on the left and read the details in the above link. And please join us us in the forums for more details, current standings, how to submit your entry, and much discussion among the jolly band of POTM participants!